History shows us that as free nations become complacent, they become vulnerable to manipulation. Most dictatorships rise gradually—a step at a time. Smooth-talking politicians make each incremental step seem reasonable, because the masses are blind to the tides of change. Austria illustrates the power of gradualism. In 1933, it was a free nation. In 1934, its government began to centralize its power and welcome the influence of Nazi sympathizers. By 1938, it had become a Nazi dictatorship. The downward slide began with one crisis after another. A third of the people were out of work, inflation rose to 25%, and political turmoil caused civil unrest. People longed for a leader to rescue them. Adolf Hitler cam­paigned in Austria, promising to solve their problems if they were annexed to Germany. A persuasive speaker, he gave them hope and won their hearts. The Austrian people voted him in. Why? How could the Austrians be so blind? The answer is simple: they faced hard times, so they chose to believe Hitler’s promises. They didn’t see him as we do—brutal, arrogant, narcissistic and ruthlessly ambitious. That image came later, when it was too late to escape his grasp. In the beginning, Hitler appeared as a caring, charis­matic, captivating visionary. His words brought hope of prosperity, and his public image was intentionally shaped with pictures of his smiles, benevolent deeds and warm encounters with children and babies. Next came gun registration, followed by attacks on freedom of speech. There were so many informers that people became afraid to say anything political, even when they were in their own homes. She tells of other changes, including nationalization of education; indoctrination of children; socialized medicine; government control of businesses; and a lack of respect for human life. Before the annexation, most Austrian mothers stayed at home to take care of their children. Under Nazi rule, both parents had to work, so the children were sent to government‑run daycare centers. Gun control came in two stages. First there was gun registration, and then the people were required to give up their guns. Once the people were unarmed, they had no way of defending themselves against the Nazis. After that, political correctness replaced freedom of speech; taxes were increased to eighty percent (four fifths of income); the nation was filled with informers; anybody who spoke against the government was arrested; and the people lived in constant fear. In Austria, the transformation from freedom to dictator­ship was incremental. No nation is immune to such things, including the United States. In fact, America seems to be following some of the same incremental steps toward totalitarianism. In 2005, Congress passed the Real ID Act. This, in effect, would turn drivers’ licenses into a national ID card. However, the law is controversial, and 17 states have passed legislation or resolutions opposing compliance with it. Congress eventually repealed the law. However, there are ongoing attempts to do things that are similar, but not as comprehensive. According to an article dated March 28, 2013, Senators Chuck Schumer and Lindsey Graham are determined to get a biometric national ID card required for everybody who is employed. And this is so important that they met with President Obama to discuss the matter. Kitty Werthmann told us how Hitler nationalized the education system. Christian symbols were removed and prayer was banned. 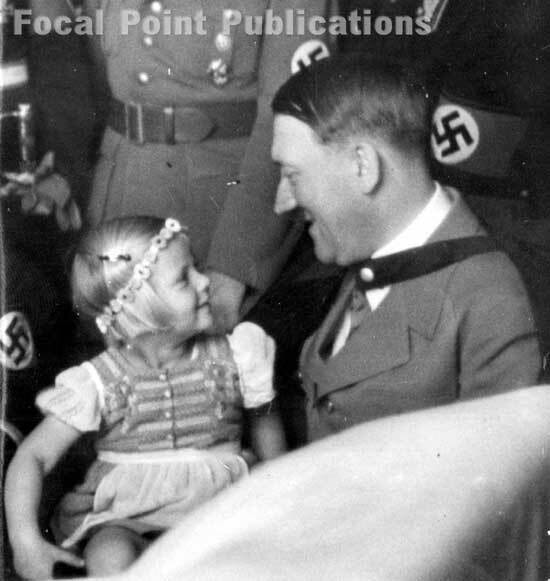 Through their government‑run child care program, the Nazis would indoctrinate the children with politically correct ideology and absolute loyalty to Hitler. Hitler worship became part of the new structure. The daycare workers were trained in Marxist psychology, not motherly love, for Hitler was fascinated with communist methods of mind control. By imposing government education at such a young age, this un‑American system exposes Christian children to the worldviews of secular humanism, neo‑paganism, and countless other beliefs that clash with home‑taught values. It subjects them to anti‑Christian peer pressure, and to teachers who are determined to undermine their faith. No wonder children raised in Christian homes from coast to coast are fast rejecting our God and His ways. Meanwhile, churches and youth leaders are bending over backwards to conform to the new values and wants of our youth. Government schools and the judicial system work hand‑in‑hand to undermine the faith of Christian children. For example, Amanda is a ten‑year‑old Christian homeschooler. She is “well liked, social and interactive with her peers, academically promising and intellectually at or superior to grade level.” Her homeschool curriculum meets all state standards. Yet, a judge has ordered her to attend public school because of her “vigorous defense of her religious beliefs.” The judge wants her to consider “different points of view at a time when she must begin to critically evaluate multiple systems of belief.” In other words, he is forcing her into government education in order to challenge her Christian faith. Buried inside the health care bill is a provision that gives the federal government control over all student loans. As a result, the government can now decide which students are able to go to college. It can also refuse loans for students who want to attend colleges that the government doesn’t approve of, thus putting financial pressure on colleges to be politically correct. Kitty Werthmann told how the Nazis killed the mentally retarded people in her village. That was a result of Hitler’s eugenics program. He was following the unconscionable Darwinian ideals of an evolving, purified human race, and he wanted to produce a Master Race of strong, intelligent Aryans. People he considered to be inferior (including Jews and the mentally retarded) had to be eliminated. Because of the Holocaust, eugenics was discredited. However, euthanasia (both voluntary and involuntary) is spreading. Voluntary euthanasia is a form of suicide, where patients choose to die—usually with a physician’s help. This is legal in Oregon and Washington. An influential bioethicist in the Obama administration actively promotes health care rationing. Obama’s health care law includes “death panels” with authority to deny life‑saving medical care. Once such care has been denied, it becomes unavailable even to patients who would pay the cost themselves. U.S. Attorney General Eric Holder has a long record of supporting gun control. In a 2008 brief to the Supreme Court, Holder claimed that the Second Amendment does not pose any obstacle to banning guns. Since the shooting at Sandy Hook, the attempts at gun control have increased in both variety and intensity. In 2008, a Commissioner of the Federal Communi­cations Commission warned that the FCC is likely to imple­ment regulations that will give the federal government control over the content of radio, TV, and the Internet. In 2009, a high‑ranking official in the FCC called for a “confrontational movement” to increase federal control of the media. He openly expressed admiration for Hugo Chavez’ efforts to stifle criticism by seizing control of Venezuela’s media. An FCC Commissioner named Michael Copps has proposed a plan: a “public value test” for media. Who will pass that government test? Those who don’t will not get their licenses renewed. This reminds me of the difference between Russian Communism and Hitler’s National Socialism. Stalin ended up with a very poor country. Hitler’s socialism allowed for government controlled “free” enterprise, and at first it seemed to succeed. The difference between the two forms of tyrannical socialism was that Stalin’s government owned everything, while Hitler controlled everything. In 2002, the federal government attempted to recruit four percent of the population as informers. These spies were to include people with access to homes and businesses, such as mailmen, meter readers, cable installers, and telephone repairmen. After a public outcry, this plan was abandoned. However, the attempt to have informants throughout the country is not new. It has continued in various ways, for years. As part of President Clinton’s war on “hate crimes,” the Justice Department had a website that encouraged children to report relatives who made a “derogatory comment.” Now that Congress has passed the “Hate Crimes” bill, we need to be alert to similar attempts to turn children into informers. A “smartphone” is a wireless, pocket‑sized computer that also functions as a cell phone. It can take pictures. The iPhone is a line of Internet smartphones produced by Apple Computer. People can get “applications” (“apps”) for it, enabling them to do a wide variety of things, including GPS navigation and social networking. A person could use their iPhone to take a picture, get the precise location of the place (via GPS), and send the picture and location information to somebody via email, or post it on the Internet. The President can legally declare a state of national emer­gency on his own authority without the approval of Congress. There is no legal accountability. Once a national emergency has been declared, the President can “take over all govern­ment functions” and “direct all private sector activities” until he declares that the national emergency is over. A Master Arrest Warrant enables the U.S. Attorney General to have people arrested if he personally considers them to be “dangerous to the public peace and safety.” He can keep these people incarcerated indefinitely without legal accountability. According to a U.S. Congressman, former Rep. Henry Gonzalez, there are detention camps in America. He said that, in the name of stopping terrorism, the President could evoke the military and arrest American citizens and put them in these camps. If American troops are unwilling or unable to carry out such arrests, then the President can use Canadian troops, thanks to a military agreement called the Civil Assistance Plan. The President can also use troops from the United Nations. The bill failed to pass. However, it was introduced again on January 23, 2013 as H.R. 390. It failed to pass, but I suspect that they will try again. Also it might be possible to bypass Congress and do it by means of an executive order. The Obama administration’s Financial Reform Bill was signed into law on July 21, 2010. It establishes an Office of Financial Research which would have “unprecedented, real‑time access to a wealth of personal and corporate financial data.” This new agency would not be accountable to anyone, and it could use coercion to get information. The Senate has a bill which would give the federal government much more control over our food supply. It threatens to increase food prices and drive many small local suppliers out of business. Even without this new law, Federal agents have already harassed small farms. In April 2010, they invaded a private dairy that doesn’t sell to the public. In March 2009, President Obama again discussed the need for a Civilian National Security Force. Another approach is the Universal National Service Act. If passed, this bill would require every American (including young mothers) from ages 18 to 42 to spend two years either serving in the military or doing national service as defined by the President. The bill contains some provisions that could be used to promote a globalist agenda. According to Judge Napolitano, if a person whose home was searched in this way was questioned in court about it, under oath, he would not be able to answer truthfully without violating the Patriot Act. In other words, he would have to either commit perjury or else violate the Patriot Act. These days, some policemen dress and act like soldiers, complete with military-looking vehicles. You can read about the extent of what is going on, and how this trend developed, in Radley Balko’s book Rise of the Warrior Cop: The Militarization of America’s Police Forces, which was published in July 2013.